This proves to me that all the fire and heat associated with landing space craft is about slowing down from orbital velocity, not altitude. 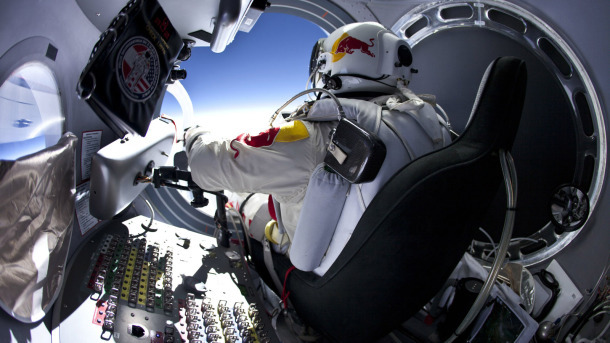 Felix Baumgartner prepares to jump at 71,580 feet- that's almost twice as high as commercial airliners at 35,000 feet! Anybody know who made the fittings and components for the space capsule, space suit, and breathing systems? Felix Baumgartner and Red Bull Stratos Team put them to quite a test! This entry was posted on Friday, March 16th, 2012 at 12:49 pm and is filed under Uncategorized. You can follow any responses to this entry through the RSS 2.0 feed. You can leave a response, or trackback from your own site. My Uncle is a U.S Navy Seal and told me theirs some insane projects that Nasa and the Navy are working on soon SEALS will be Sea Air Land and Space talk about the ultimate warrior.